In the mountains of Caucasus lies a wonderfully distinct language family called Kartvelian, or the South Caucasian language family. One particular language in this family, called Georgian, is especially unique for many reasons. Related to other members of the south Caucasian family, such as Svan, Laz and Mingrelian, Georgian has approximately four million speakers, most of whom live in the country of Georgia. But there are also speakers in other countries as well, some of which are Azerbaijan, Iran and Russia. Georgian has three alphabets and a complex grammar, and these parts of the language are what make it wonderful. 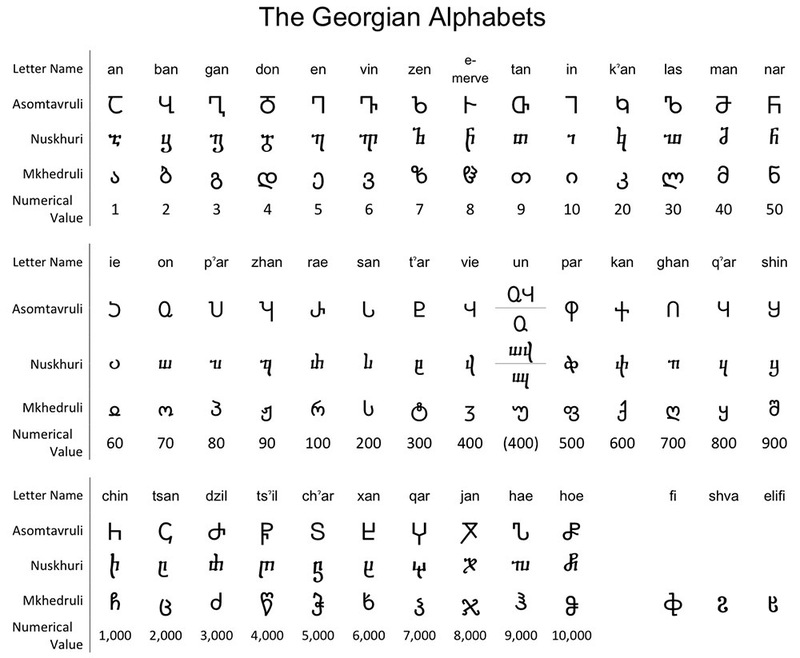 Before Georgian had its own three alphabets, it was written using one form of Aramaic, a Semitic language. Asomtravuli emerged as the first alphabet in the Georgian language, as it became known for using capitalized letters, modeled after some parts of the Greek alphabet. The second and third alphabets, Nushkhuri and Mkhedruli, soon followed. Asomtravuli was eventually replaced by the Nushkhuri, the lowercase alphabet. Yet Nushkhuri too, followed the same path of Asomtravuli, eventually replaced with the third alphabet. This third alphabet, Mkhedruli, is the one that is still being used until now, and personally seems to be the most aesthetically pleasing among the three. Since it has existed, the exact origin of the three Georgian alphabets is still being debated within the linguistic community. In terms of grammar, the language has seven unique grammar cases which separates Georgian from other European languages. Georgian uses seven grammatical cases, which are: adverbial, dative, ergative, genitive, instrumental, nominative and vocative. Most other languages use less than that. English only has three grammatical cases. Georgian is a remarkable language for the reasons mentioned above, and it certainly deserves more recognition.